Will The SALT Tax Deduction Change Affect You? In December Congress passed, and the President signed into law a tax reform bill. There’s been, and continues to be, much discussion about exactly who benefits the most from the changes. That’s something that will likely not be fully resolved until we see tax returns and how the economy reacts over the next few years. In the meantime, many people are wondering exactly how the bill will affect their taxes. One change that will likely affect many taxpayers is the change made to the SALT (State And Local Tax) deduction. Currently, state and local taxes can be listed as a tax deduction, and there is no limit on the amount. This includes state and local income taxes, sales taxes, real estate taxes and personal property taxes. However, under the tax code changes, this deduction is capped at a maximum of $10,000. There may be some more complex scenarios, but the following steps should give you a good idea if this change affects you. First, you’ll need a copy of last year’s tax return. You may actually want to look at the last few years, just in case, last year’s taxes were not indicative of your usual tax situation. If you filed your taxes using form 1040EZ, you used the standard deduction and this change to the tax code will likely not affect you. SALT only comes into play if you itemized your deductions. If you filed your taxes using form 1040, look at line 40, and the mini-worksheet just above it. It should indicate whether you used the standard deduction, or if an itemized deduction value was used. 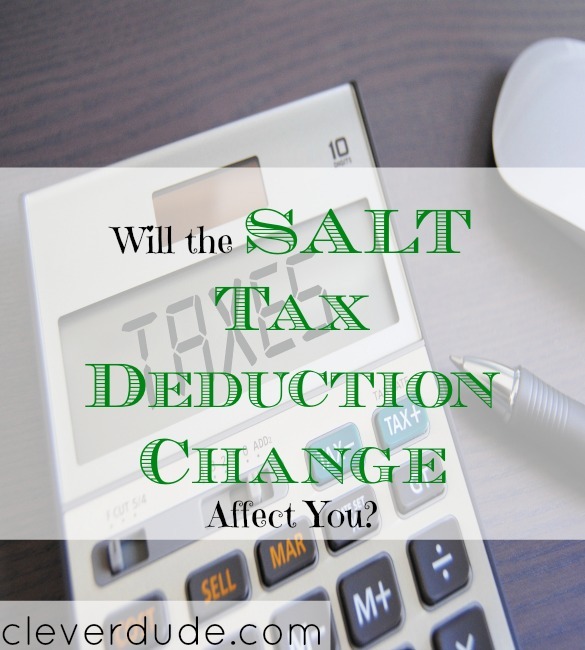 If the standard deduction was used, OR the itemized amount deducted is less than $24,000 (the new standard deduction under the tax code), the SALT deduction change likely will not affect you. If an itemized deduction value was used, and your total itemized deduction value is greater than $24,000, then further investigation is necessary. If you itemized your deductions, you will need to look at Schedule A to determine how much of a SALT deduction was claimed. Add together lines 5, 6 and 7 of Schedule A. If this amount exceeds $10,000, your SALT deduction would have exceeded the new cap and your overall tax return may be affected. The tax code changes will affect many people, some negatively and some positively. One change that will undoubtedly impact the taxes of many people is the change to the SALT deduction. These simple steps will give you a good idea whether the changes to the SALT deduction will affect you, but it’s certainly not complete. If you have further questions, it would be a good idea to consult a tax professional. How about you, Clever Friends, will you be affected by the changes to the SALT tax deduction?